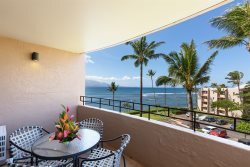 Lovely Prime Ocean Front at the popular Maalaea Kai Complex! The decor exudes the perfect ocean ambiance for a peaceful and cheerful vacation. Convenient amenities provided for guests are free secured wifi and high-speed internet, cable, telephone. The elevator is conveniently located nearby and condo has own assigned parking space too. Shared laundry facility is super clean and spacious and there is one located on each floor with 3 large capacity washers and dryers each and conveniently located just two doors away (fee for laundry usage - cc payment or pre-paid cards accepted only). Other coveted amenities to enjoy are of course the large newly renovated and heated pool, very nice and inviting bbq and dining area and plenty of pool side lounges with the sunset and tiki torches setting the evening atmosphere for that perfect Maui vacation. Fabulous Above and beyond expectations!!! FABULOUS Everything was perfect! The view is amazing, breathtaking and memorable. The condo is very clean and in excellent condition. Exactly like the pictures. The beds are VERY comfortable. The ground keepers keep everything impeccable from the pool to the public restrooms to the laundry room to the BBQ etc... They have all you will and a lot more. You do see surfers and amazing WAVES. Great vacation! The best! BOOK IN CONFIDENCE. Excellent Condo! The unit was updated, well appointed and provisioned. Having the beach gear (towels included) made beach trips a breeze. Big Beach was our favorite! We were able to walk to the harbor for snorkeling cruises and able to explore most of the island from this central location. Check in and check out was a breeze! Excellent location. Beautiful views. Beautiful condo. This place was perfect. We absolutely loved the location. Perfect for adventures to all parts of the island. We loved being close to the marina. Easy walk to nice restaurants, aquarium and marina. The grounds were immaculate. The grass was like walking on carpet. We watched turtles play in the surf. The condo was beautiful. Nice views. Well equipped. Couldn't ask for more. I took my wife and two children, ages 22 and 18 for 5 nights in July. When we arrived, everything was very clean, fresh flowers arranged nicely, lights on and air conditioning running. We enjoyed the lovely pool area and the nicely landscaped area. We saw numerous sea turtles right along the sea wall, and loved the morning views of Haleakala. We especially loved the use of the beach chairs, cooler, nice beach towels and cooler! Thank you for providing these useful amenities!! I could only imagine the great viewing of the whales when in season. We will have to come back! Thank you for sharing your place with us. Ma'alaea Condo. Nice complex that is maintained meticulously. Unit was clean and comfortable. Great having 2 master suites! Central location made it easy to travel anywhere we wanted to go! Would definitely recommend to friends and family. This condo was comfortable, quite, and very clean. We were traveling with two teenagers so I loved that each room had its own bathroom (so they had their own space). It was also a pleasant surprise to find all the beach stuff waiting for us (chairs, towels, snorkel gear, sand toys, and boogie boards). It was extremely relaxing to sit out and watch all the turtles. We had a wonderful week and look forward to our next trip to the island. This condo was amazing! Super Condo in a Great Location. Maalaea Kai 307 is a great condo in an excellent location less than a five minute walk to all the harbor attractions and restaurants. The condo was well equip with everything we needed while staying in condo and going to the beach. Both the bedrooms having en-suite bathroom was especially nice. We enjoyed eating all our meals on the lanai while watching the ocean. The trade winds keep the condo cool making it unnecessary to run the air conditioning. Checking emails and surfing the internet in the morning while sitting at the computer desk watching the ocean was a great way to enjoy a cup of coffee in the morning. We definitely will be returning to MK307 on our next trip to Maui. I Go Maui make check in and check out easy and was available to answer any questions we had. Great Location, Amazing Condo, Super Vacation! Thank you for sharing your fabulous home with us! The location and the view were incredible! The best place for outdoor activities and whale and turtle watching! A few steps from the harbor with a cosy beach, aquarium and restaurant and in walking distance to the beautiful sandy beach. Maalaea #307 condo was super and the amenities with the heated pool were excellent! Upon arrival, we were amazed by the welcoming Hawaiian atmosphere. The spectacular view, charming Hawaiian decoration and the flowers were greeting us. We stayed in the condo for a week and loved it! Everything was clean and comfortable. The modern kitchen was fully equipped with everything we needed, the furniture was very cosy and had enough room for all of us. We liked the desk with the USB charges on the desk lamp and a lot of room for all of our laptops. We also were pleasantly surprised when we found out that in each room there was a TV. The living room had a big screen TV that we could not find in the other condos. The room temperature was comfortable without using the AC. We used the screened security door and left the regular door opened during the day. At night it was cool enough. Our family spent a lot of time exploring the island, walking on the beach, swimming, golfing, kiteboarding, whale and turtle watching, Loved to sit on lanai in the evenings! We all had a great time and are planning to return and to stay in this condo again. Mahalo!